Poule d’Or proudly presents the exclusive first single off Sutja Gutiérrez forthcoming album Sutja Gutiérrez Original Soundtrack! Lucy (Love Scene) features Sutja’s dreamy vocals melding with crisp guitar riffs creating an all smooth and joyful lo-fi soundscape – total bliss! New year, new album. How long have you been working on ‘Sutja Gutiérrez Original Soundtrack’? 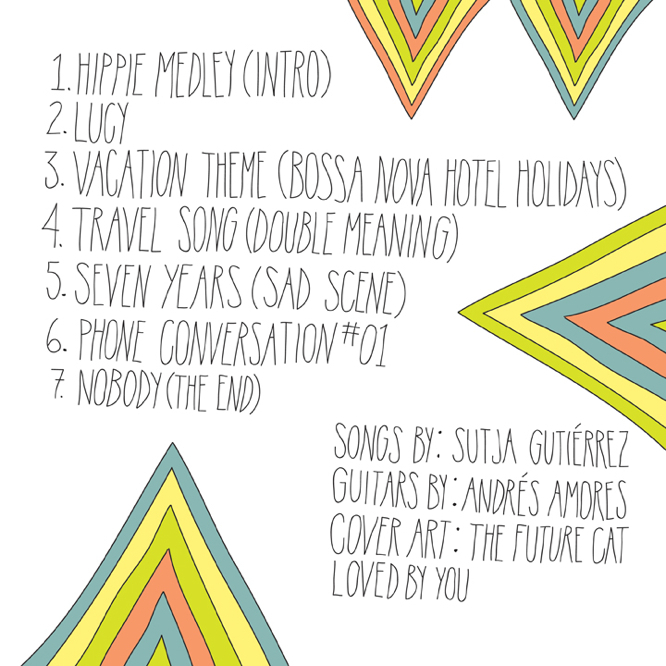 Sutja Gutiérrez Soundtrack is recorded in 2 or 3 weeks.. lyrics and ideas: 1 year, like all of my stuff. How did you approach the production and writing of the songs, did you do anything different from the previous EPs? Oh yes, every EP is my own evolution, musically and creatively. On this “Sutja Gutiérrez Original Sountrack” we just recorded the vocals like always and the rhythms are more natural.. but not at all. Guitars recorded in two days with my friend Andrés Amores. Did you feel any pressure to create a certain sound to please your fans? I think at the moment my fans don’t know what i’m doing… and this is the game in my music at the moment. If you make a concrete music, is hard because you work into the fashion. How do you get your mojo? My mojo, hmm I don’t know.. I think it’s more than mojo. It’s like a climax. Do you ever hate anything? Last thing I hate .. the hate and ignorance of the people. If this album was the soundtrack to a big Hollywood production about Sutja Gutiérrez, who would play the role of Sutja? I think my life is more than a film and actor, I don’t know. I hope me, because it’s hard to be me. Who are you, Sutja Gutiérrez? Find Sutja : facebook / twitter / homepage / youtube channel and also enjoy the previous photo-interview with Poule d’Or.